Welcome to week 5 of Email Marketing 101! Just joining us? Catch up below. If you can relate to having a tiny list that primarily consists of family and friends (that may or may not have been added without their consent), then this week is for you! With a few simple tactics, it’s absolutely possible to have a list full of people who are not related to you! In order to make that happen, I’m going to show you where to put email opt-in forms on your website. Once that’s done, we’ll cover how to promote your lead magnet. With every opt-in form, the most important thing is to mention your lead magnet. Avoid using generic text that invites people to sign up for an email list or a newsletter. That’s not going to entice anyone. Instead focus on the helpful freebie they will receive when they sign up. It’s also important to include a photo or mockup of your lead magnet. Not only does this make it visually more appealing, it also gives people an idea of what they will receive when they sign up. Footer – One of the most important places to put your opt-in is in the footer of your website. This ensures that it will be on every single page of your site. With the way SEO works, you never know how someone is going to stumble upon your site, but many times your homepage will not be the way they enter. Blog Sidebar – Speaking of SEO, if you’re blogging consistently it’s very likely that someone will find your website through a blog post (maybe that's how you ended up here). For this reason, you'll want an opt-in in the sidebar of your blog (see mine to the right). That way it will be one of the first things people see when they come to your site. Unfortunately, many Squarespace templates don’t have the option for sidebars, but if you’re using one that does, be sure to take advantage of it. Pop-Up – Opt-in pop-ups are a new feature that Squarespace has recently enabled. You need a business account to take advantage of this feature, but it’s definitely worth it, since pop-ups have one of the highest conversion rates. Landing Page – This is an important one, so pay attention! You absolutely must create a landing page that promotes your lead magnet. There should not be any navigation on this page. There should only be an image of your lead magnet, a description of it, and a form to opt-in. To do this in Squarespace use a cover page. Here's mine as an example. Banner – The last place you’ll want to promote your opt-in is in your banner. Technically this won’t be an opt-in form itself. Instead it will mention your lead magnet and click through to your landing page where people can sign up. This is good to have because like the footer, it will appear on every page, but no scrolling is needed to see it. In order to get some emails on your list, you have to start promoting your freebie. The best way to do this is to utilize social media, of course. To do this effectively create some text-based ads to post on a regular basis. The more often you post the better, but at a minimum post once a week. Ideally you want a few different ads, so you can post them frequently while still maintaining variety in your feed. You'll also want some vertical ones for IG Stories and Pinterest. Below are some ads I created for my own lead magnet. Every time I post them on Instagram I always get an influx of new sign-ups. The next thing you need to do is update your website link on all social media accounts to lead to your email list landing page. If you’re tempted to forego this step, stay with me for a second. Since there is no navigation on this page you will be forcing people to either sign up for your list or leave your site. It sounds scary because we assume most people will choose to leave, but I can tell you from personal experience that’s not the case. Looking at the analytics of my site, over 86% of people sign up for my list when they visit my lead magnet landing page. That’s huge and a far better conversion rate than any of the other opt-in’s on my site! As for the 14% that didn’t sign up, they probably weren’t in need of my services to begin with. At the very least give it a try for a few weeks and see what happens! 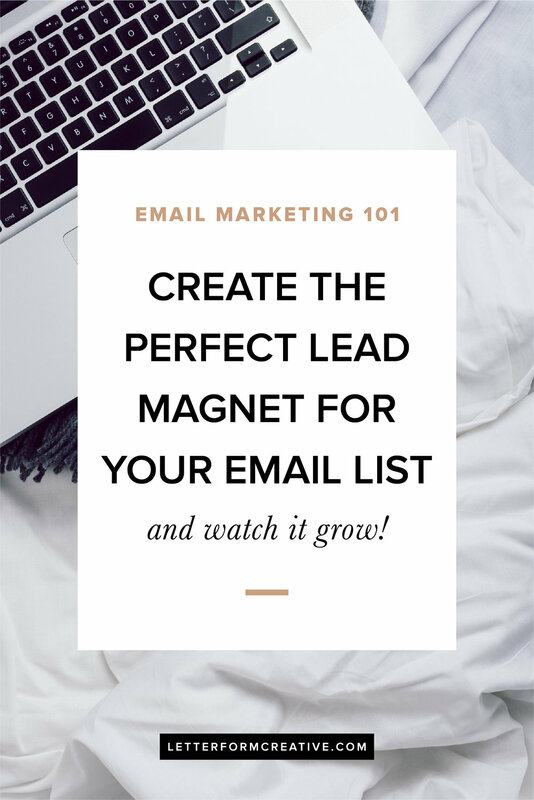 If you have an email list, what's your best tip for promoting your lead magnet and getting sign ups? Comment below! This week I’m showing you how to create an automated welcome sequence in Mailchimp. What is a Welcome Sequence? A welcome sequence is a series of 5-7 emails that are automatically sent out over a period of a week or so, after someone has signed up for your list. As I’ve mentioned before, the rule of 7 says that someone needs to come in contact with your business that many times before trusting you enough to make a purchase or hire you. A welcome sequence allows you to hit those seven interactions really quickly. The first reason to setup an automated welcome sequence is to efficiently deliver your lead magnet when people sign up. When I first started my list I was manually sending my freebie to new subscribers, which was not very efficient! Save yourself the hassle and setup an automated delivery as soon as possible. The next reason is to familiarize people with your business and show them your expertise. You can do this by providing free information and resources that will help them with a problem they have. It’s only after you’ve done this that you should try to sell to them. Below is an outline you can follow to set up your own welcome sequence. Make sure that each email serves a purpose and provides different content than the others. Feel free to adjust this for your own business as needed. How Do I Automate It? Mailchimp makes it really easy to setup an automated welcome sequence. Watch the video below to learn how. As always, feel free to post your questions in the comments below! Today we’re talking about lead magnets: what they are, why you need one, and how to create it. A lead magnet is the freebie that subscribers receive upon signing up for your email list. This is the main freebie that you will promote all over your site. If you offer a freebie within a blog post that’s called a content upgrade and is usually a smaller offer than your lead magnet. Since no one needs another email in their inbox, you have to give people a reason to sign up. To create a strong lead magnet identify a common problem your ideal clients have and find a way you can help them solve it. It’s great to get some feedback from your audience. Take a poll on IG stories or put it out on Facebook and see what people need the most help with. You want to offer something of value, but remember that you’re giving it away for free, so it doesn’t have to be a ten page guide. A 1-2 page checklist is perfectly fine. While this is intended to be helpful to subscribers, a good lead magnet will also show people the value of hiring you. I’ve had lots of people start going through my mini branding guide, just to contact me a few days later because it made them realize how much they need professional help. Once you’ve decided on the content for your lead magnet, decide what form it will take from the list mentioned above. Here's a more in-depth explanation of each. These are great for guides and che­cklists. To make one you can hire a designer (I know a girl…), or purchase a template (check out Etsy or Creative Market) and customize it yourself (usually in Photoshop). To deliver your PDF upload it to Dropbox, your website, or Mailchimp and send the link out in an automated email. An email course is perfect for a series or a challenge. It may also be easier to create than a PDF, depending on your skillset. To set it up you will create an automated sequence in Mailchimp (which we’ll cover next week). These are great for product-based businesses. However, for service-based businesses it’s not ideal since services are usually a larger investment than products. It’s better to offer something that doesn't require making a large purchase. This is great when you’re just starting out, but aren’t sustainable long-term. When I first started my list I offered half hour brand reviews. I sent out a link to sign up via Calendly and used Skype for video chats. It allowed me to connect with people one-on-one and provide personalized help. This gained me new clients quickly since the know, like, trust factor was built immediately. If you have the time, I recommend this while your business is small enough to handle it. Once your list gets larger you won’t have the capacity to devote time to each new subscriber. Have an idea for your lead magnet? Need some feedback? Post in the comments and I'll let you know what I think! If you're not convinced that you need an email list, check out last week's post then meet me back here! 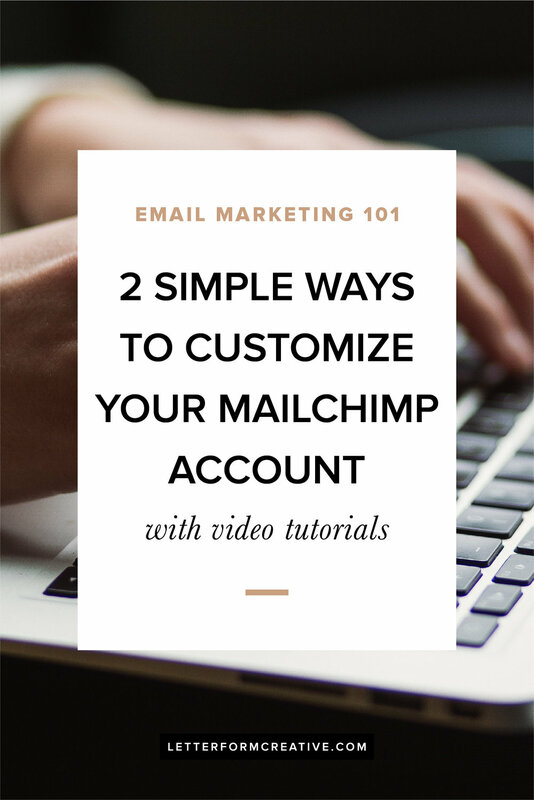 This week in Email Marketing 101 I'm showing you how to make some simple customizations to your Mailchimp account. You can sign up for an account here. A free one will get you started, but to create automated emails for your welcome sequence (which we'll cover soon) you'll need to upgrade your account. When you create your account it will automatically create a list with your business name. You can use this for your main email list. Eventually you may have multiple lists or segmented lists, but since this is Email Marketing 101, we’re not going to worry about that yet! To get you started with Mailchimp, I've created some video tutorials to walk you through the basics. There are two videos this week. The first one shows you how to create a template in Mailchimp. This doesn't take long and will make sending emails easier in the long run by providing a consistent, branded template that you can use every time. This second video shows you how to customize your confirmation email. This is what people will see when they confirm their subscription to your list. Rather than using the generic Mailchimp confirmation, we're going to customize it to create a more professional, on-brand impression. Once you’ve done those two things you’re ready to get some people on your list! In order to make that happen you’ll need an enticing lead magnet, which is what we'll cover next week. Stay tuned! Have questions about email marketing? Leave them in the comments! Today we have the privilege of hearing about Liz Frandsen's journey as a small business owner! She designs handbags and small leather goods for women. Liz is based out of her home studio in Lancaster, PA and has been in business for three years. Her business name, Liz Riden, is her maiden name, since it has more of a "designer" ring to it! She currently designs, cuts, and sew ALL of her bags by hand! And they are SO beautiful! In college I had the opportunity to work for some pretty big designers in New York City. It was one of the most incredible learning experiences of my life, but also really made me realize how much I would love to create my own brand and product, and ultimately not work for a big corporation. The flexibility was a major draw for me! What do you wish you had known when you were starting out? Something that I'm still learning today. That success isn't overnight, and that being a small business owner often means working WAY more than most jobs. But, that the payoff is totally worth it to get to be your own boss and pursue your dream. For other product-based business owners, how would you recommend finding a manufacturer? Finding manufacturing partners that you can trust to create your vision to the right quality is really key to scaling your business. There are several things I recommend. Maker's Row is a fantastic resource for product based brands to find factories and sources. While it's mostly for fashion, there are many factories that are skilled in many types of products! Also, when it comes to manufacturing, the industry is still pretty old school. I've found most of my insider sources simply by a Google search and going to the garment district in New York! Always meet with them or set up a call to discuss their work and make sure it's a good fit. Chances are, if they know other great resources they will be willing to share them too! What does your process look like from concept to completion? My design process from concept to completion starts with sketching and pattern making. I am a very hands on designer, so I like to start by drawing my ideas out and drafting a pattern on paper to see how it fits together. Flat pattern drafting basically involves measuring out the dimensions and pieces in a two dimensional way, and then piecing them together to make the three dimensional final product. Once the pattern pieces are measured, I cut them out from cheap vinyl material and sew it together. I use vinyl for the first draft because it's cheaper than genuine leather and allows for mistakes to be made. Typically, my pattern process takes 2-3 revisions before it's exactly where I want it to be. Once the pattern is perfected, I make the sample in real leather to photograph. Currently, all of my bags are made to measure, so I will make one sample and then create orders as they come in! What has been the most effective strategy for selling more products? For my product-based business, Instagram has been an absolute game changer in the way I do sales. I've found that not surprisingly, the more I share my work, the more it generates sales. In addition, I've started expanding my wholesale division of my brand. I've found that being spread out across the country has grown my customer base quickly and that once customers shop in stores, they connect on Instagram and then that also grows future e-commerce sales. What has been the best financial investment you've made in your business? The best investment I've made in my business has been quality equipment. I started off my business with very cheap machinery because it's what I had and could afford. Now, having the proper equipment allows my workflow to be more efficient, and the quality to be immensely better. Also, having proper leather working equipment has allowed me to do freelance work for other brands and designers who may not have those resources. What's your favorite business book, blog, or podcast? I can't get enough of the podcast How I Built This with Guy Raz. It's so good! It's encouraging to hear about MEGA brands that got started from humble beginnings and all about how they did it. I wouldn't be lying if I said I secretly hope to be on it some day. How do you rest, recharge, and find inspiration? As a small business owner and mom, rest is something that's hard to come by! But recharging and inspiration are not. I'm fueled by lots of coffee and good company. I find inspiration in short day trips, art and art history. Today's interview is with Alana Oates, founder of Llani Shoes. She produces the most fun and stylish slippers, flats, and slides that provide the comfort of home from anywhere. Read on to learn about her experience running a small business. AND...if you make it to the bottom there's a little treat for you! I launched Llani in 2016, but the decision happened way before that. It was always a nagging idea in the back of my mind. I was working for a large corporate company in San Francisco, but my fiancee was on the east coast in the home we bought before I said yes to the opportunity that took me across the country. My motivation to get home really propelled me to take the steps to start the brand. I knew I wanted to 'come home' and in doing so, I wanted to work independently. I think for a few months when I was sampling shoes and figuring out how and when to launch, I took it all a bit too seriously. I obviously wanted to put my best work into the world and I thought that once I decided on an identity, a logo, a color story, it could never change and it would determine the brand ID forever. I soon realized, it was better to launch and let the brand evolve it's self. Now, I let my customers choose what they want to see more of. I follow my sales patterns, for sizes I buy into, and I pay attention to the feedback I get on social media to determine my next steps. I was lucky that I had a strong background in sourcing from the larger companies I worked for, but I found a lot of my current vendors through Linked-In. Some approached me, some I sought out. The best thing is to have an idea in mind of want you want. I knew I wanted to work in India. I have always been inspired by the culture, and I love their hand-crafted atheistic. My collection features a lot of hand beaded work, and it's one of the only places in the world I can get the quality I wanted for the right price. Figure out what area will be best for what you need to produce, and work from there. I do a lot of influencer outreach. For me, I like to reach out to girls who are also business owners, or creatives. Maybe they don't have the largest followings, but they have a curated feed and great fashion sense, while also having the integrity to showcase smaller brands and tell their story. These girls are thrilled to get a pair of my shoes, and post a photo in return. Instagram has been a god send for me. I don't know how small businesses launched before social media! My largest investment has directly been into my product. I have really tried to keep all other costs lean. It's the most important piece of what I do, so investing in that first and foremost was the best move. Just this year I took another big step and partnered with a PR firm in NYC. That was my second biggest investment, but waiting one year to take the step felt like the right timing. I hope it will be a game changer. What is something you regret or wish you had done differently in your business? I really can't say I regret anything to date. There are small learns I encounter everyday, like ordered too much of one size and not enough of another. But that can all be channeled into the next season to make that one a success. I'm forced to learn through trial and error. I love to listen to Girlboss radio, in the mornings while I'm getting ready for my day. Sophia features amazing women who have started their own companies and listing to their journeys really inspires me. I love to socialize and I gain a ton of energy from doing so. Trying to unplug on weekends is huge for me too. My husband and I often go to the shore on weekends with our dog, getting away from the office and taking a walk on the beach with my family is the best way for me to relax. Don't be afraid, don't delay, start now and worry about perfection later. Don't forget to follow her on Instagram. Thanks so much for sharing, Alana! It's fun to share final logos, but it's even better when I have a "before" logo to share alongside the final one to show the transformation that took place. As the name suggests, this logo is for videographer who specializes in family films. Audrey, the owner, was ready to look more professional and wanted a logo that communicated that. The original logo didn’treflect the solid investment that Audrey’s films truly are. Below is the mood board of inspiration that we used to guide the design process. It’s one of my all time favorites. It’s so cohesive and came together pretty effortlessly. The moody lighting, feminine color palette, and classic typography all work together so beautifully. To improve Audrey's logo I chose fonts that paired well together and looked more polished. The serif font says timeless with an air of nostalgia. The sans serif and clean lines keep it current and relaxed. The color palette is soft and romantic, and the muted tones have a moody air. The overall result is professional, yet still soft and relaxed. “Megan worked with me to create a logo for my growing family film business. Even though I only did a logo and not a full brand, I feel like she treated it like so. The questionnaire dove deep into my brand and my ideal client and really helped me consider things about my business that I hadn't before. The options she sent me were all the look I was going for and was a hard decision to choose between them. Wondering if your own logo needs a refresh? Here’s a quick little test you can take to find out. Show your logo to someone and ask them for three words to describe it. You can do this by posting your logo in a Facebook group, asking a friend, or email it to me and I’ll tell you what I think! Does your list line up with the feedback you received? If not you know it’s time for a logo refresh. Hopefully this before and after example gives you an idea of what’s possible with professional help. I also hope this little logo test has given you some insight into how well your logo is working for you. Please take me up on the offer to give you some quick feedback! I LOVE hearing from you and am always willing to give away some free help whenever I can. Do you already have a logo you love, but need to complete the rest of your branding? If so, download my FREE Mini Branding Guide to walk you through everything else you need.